In this paper, we investigate the controllability for the one-dimensional plate equation in intervals with a moving boundary. This equation models the vertical displacement of a point x at time t in a bar with uniform cross section. We assume the ends of the bar with small and uniform variations. More precisely, we have introduced functions α(t) and β(t) modeling the motion of these ends. 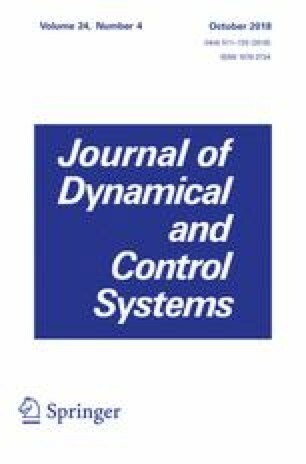 We present the following results: the existence and uniqueness of Nash equilibrium, the approximate controllability with respect to the leader control, and the optimality system for the leader control. A correction to this article is available online at https://doi.org/10.1007/s10883-018-9417-8. We would like to thank the professor L. A. Medeiros by gentle suggestion of this problem and also to professor Marcos Travaglia for his comments on the manuscript. Moreover, the authors are grateful to the anonymous referees for their constructive comments and suggestions, which helped in improving the original manuscript significantly. Cui L, Song L. 2014. Exact controllability for a wave equation with fixed boundary control. Boundary Value Problems. https://doi.org/10.1186/1687-2770-2014-47.